The wagon version of BMW’s Mini has finally gotten an update for 2016, and while it’s arguably less quirky than the first-gen one it replaces, it’s now a true four-door wagon (well, six doors if you count the two at the rear). I think it looks pretty good, and seems to be more usable and practical than the one it’s replacing. Anyway, now that that’s all cleared up and you are now armed with a new bit of automotive pedantry, let’s check out this new Clubman. 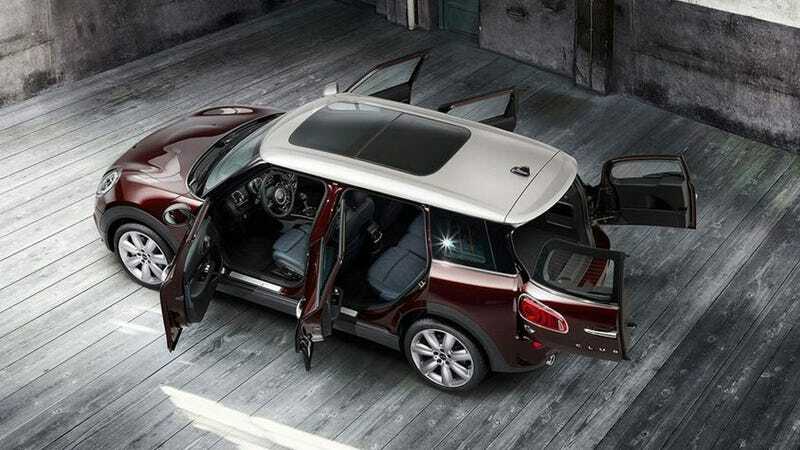 It’s based on the new five-door Mini, so instead of the solitary right-hand side suicide door, you’ve got four real doors. They’ve kept the traditional split barn-doors at the rear, and they now are sporting the largest taillights I’ve ever seen mounted on a door. Gone is the old clever hinge that went around the rear lights on the old one, which would let you drive legally with cargo extending out the back. I’m not sure if there’s a solution for that on this new one, though I suppose it’s possible brake and indicator functions are duplicated in the rear lights inset into the bumper. If you like hauling long 2x4s and stuff like that, this is worth looking into. Like all new MINIs, it’s bigger than the 1st gen Clubman (about 10 inches longer and 5.5 inches wider), and will feature the same range of three- and four-cylinder engines (134 horsepower 1.5-liter three-cylinder, a 189 HP 2.0-liter four-cylinder, and the JCW 228HP 2.0-liter four-cylinder). It’s actually the same platform as the BMW 2-series Active Tourer, if that makes you feel cooler. Even though Top Gear magazine notably trashed the first gen Clubman (“shuddery, messy and as comfortable as a marble mattress”) it’s still my favorite variant of the modern Mini because it’s as practical as the silly SUV versions, even though it’s now actually bigger than the current Countryman. Mini really needs to make at least one car that’s actually mini at some point. This update isn’t really shocking, but it’s a pretty sensible update, and now adds another modern wagon you can get in the US, which is always a good thing. In Europe at least you can spec a manual, diesel, and maybe brown one, which, of course, is widely known as the auto-geek’s ideal. We’ll see if any of those options get stateside.